My nephew Cory has wanted to make a barbecue and brewery trip down to Houston for some time. Finally our calendars lined up and we planned out a trip for February 28th. Even though I live in the Houston area, I don’t give enough props. The barbecue scene here is really beginning to heat up and while I’ve done some articles and covered some of the places I think I need to do some more Houston-area-only barbecue runs. With Cory’s visit it was an opportunity to hit up a couple of joints. Cory is a big brew guy and his one requirement was 8th Wonder Brewery. I routed us to a second brewery, a distiller, a couple of barbecue joints, and some side trips. 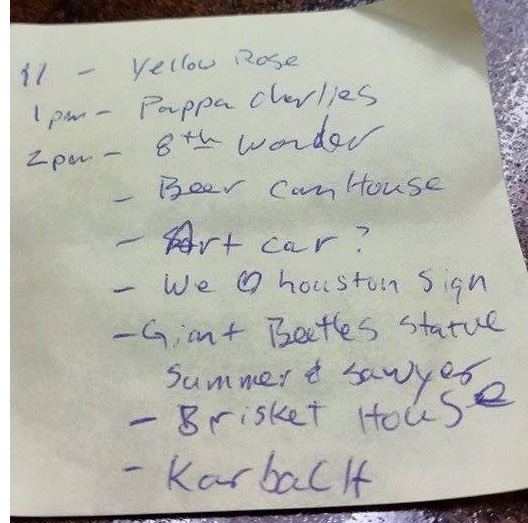 I wanted him to see that Houston can be weird like Austin so I put the Beer Can House on our itinerary and had hoped to stop by the Art Car Museum. We got to most of them, and yes I misspelled Beatles. I had written off the “big two” barbecue joints, Corkscrew and Killen’s, because the lines and related wait would take up too much of the day, not to mention that they were far from the other planned stops. I chose two joints that would open Cory’s eyes to two different cooking methods of barbecue. The first is wood smoked barbecue via the “hot and fast” method. In contrast to the “low and slow” method touted as gospel by many, a few individuals can crank out great barbecue running hotter and in much less time than what is commonly accepted. One of the proponents is celebrity cook Myron Mixon. The second barbecue stop would be a joint that employs a Southern Pride. 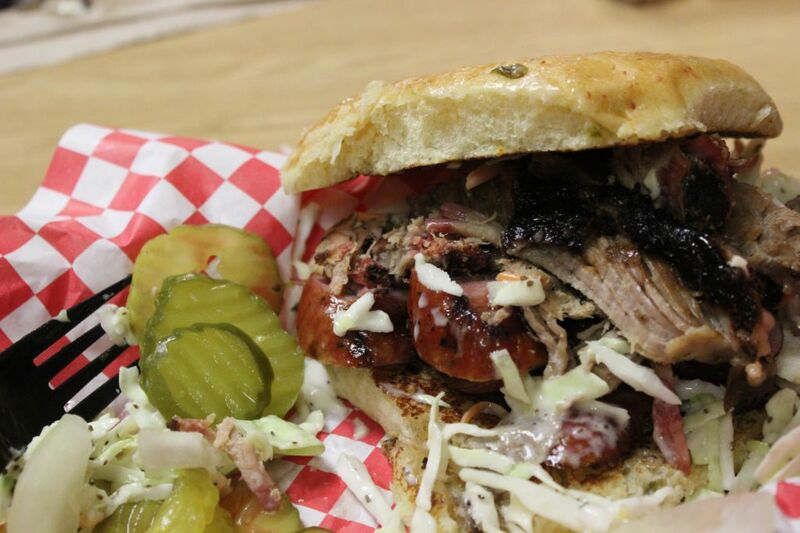 Many times considered a sign of poor barbecue, there are also a few pit masters that can cook the heck out of one. You can check out my previous article about gas fueled smokers here. I wanted to challenge Cory’s taste buds to a joint that cranks out good barbecue from one of these damned devices. Now to give a little background, Cory is no barbecue novice. He’s eaten at Franklin, Snow’s, John Mueller, Louie Mueller, Stiles Switch, Opie’s, and a ton more. Suffice to say that he knows what good barbecue tastes like. 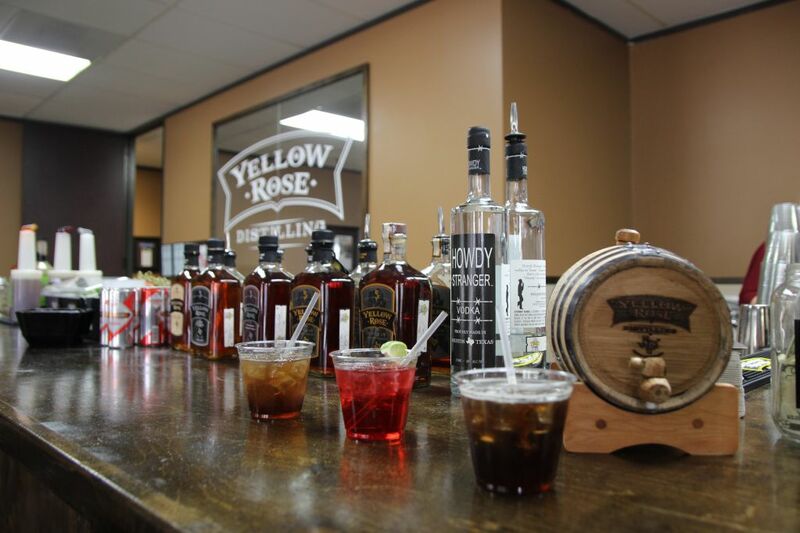 With a jam packed day and night planned we headed off in the morning to Yellow Rose Distilling. This was whiskey for breakfast for Cory and myself while Leslye had grabbed a bite to eat before we left. We ordered a cocktail first while waiting for the tour and while I am not a big whiskey guy, I thought it was good. 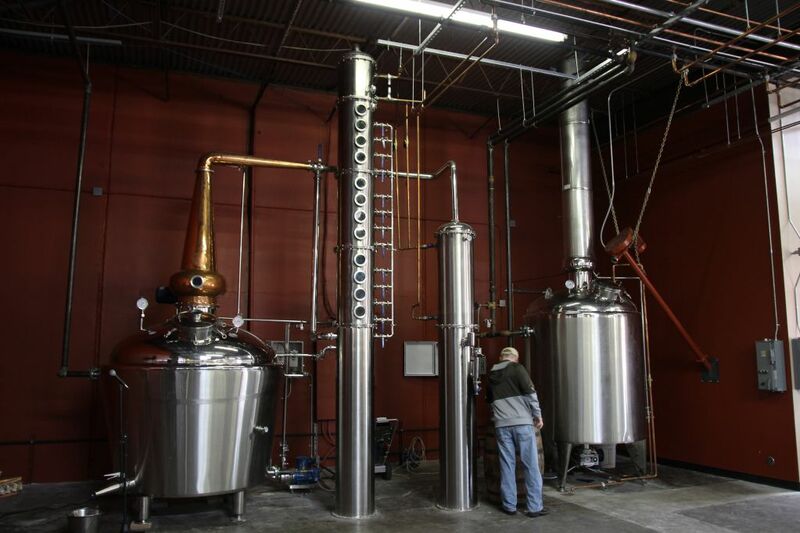 The distillery is small and tucked away in a business park. The tour consists of viewing the stills, the cask area, and the bottling room before the tasting. Of the varieties offered, I preferred the blended whiskey which is reminiscent of Crown Royal. After downing a strong cocktail the 4 small samples of whiskey and sample of vodka set the mood for a long boozy day. Luckily we were going to pace ourselves pretty well and had a designated driver when needed. We were getting hungry but were quickly on our way to our lunch stop, Pappa Charlie’s barbecue. Wes Jurena sets up his rig at Jackson’s Watering Hole in the Montrose and we rolled in ready to eat. Wes cooks hot and fast so there isn’t always a pretty smoke ring, but it doesn’t affect the flavor. 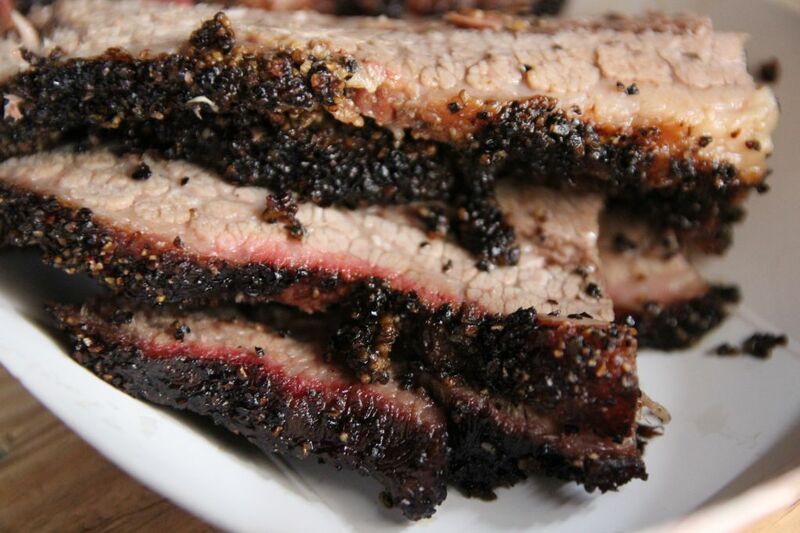 Tender, moist, and with a nice heavy pepper bark (similar to the Mueller family style) his brisket ranks at the top of my list for Houston and can hang with the best of Texas. I will be updating my Houston top barbecue list very soon, and he’ll be in the top 3. Cory gave an enthusiastic thumbs up to his first good Houston barbecue. Cory also bought us a couple of 8th Wonder’s Dome Faux’m beer to prep us for our next stop. More on that beer in a moment. Mac and Cheese is a must. Toss some brisket in! 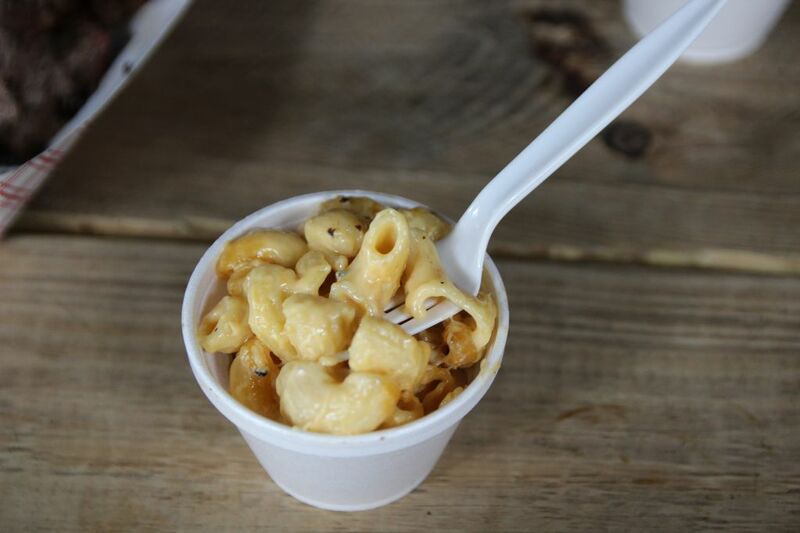 A must-buy for us every time we visit Pappa Charlie’s is the smoked mac and cheese. Leslye, who has Celiac disease and shouldn’t eat gluten, still downs a cup of it when we visit. Just to be clear, she has been diagnosed and gluten free isn’t a “diet” or lifestyle choice, it’s something we have to live with. There is nothing fun or cool about paying $5+ for a loaf of gluten free bread. Back to the barbecue – the ribs are darn good as is the sausage and I’ve never had a bad protein from here. Pappa Charlie’s does not get enough publicity; this is some great ‘cue. With our hunger sated it was time to drive through downtown and make our way to 8th Wonder brewery. In June of 2013 laws were passed in Texas that included allowing craft breweries and distilleries to sell their product directly to the public. Prior to the passage of the law they could offer free samples while selling glasses, clothing, etc but an individual could not purchase beer to consume on premises. The passing of the law caused dramatic change in the atmosphere and experience in the Texas brewery scene. What used to be a fairly corporate and cursory tour and visit has turned into a downright party. 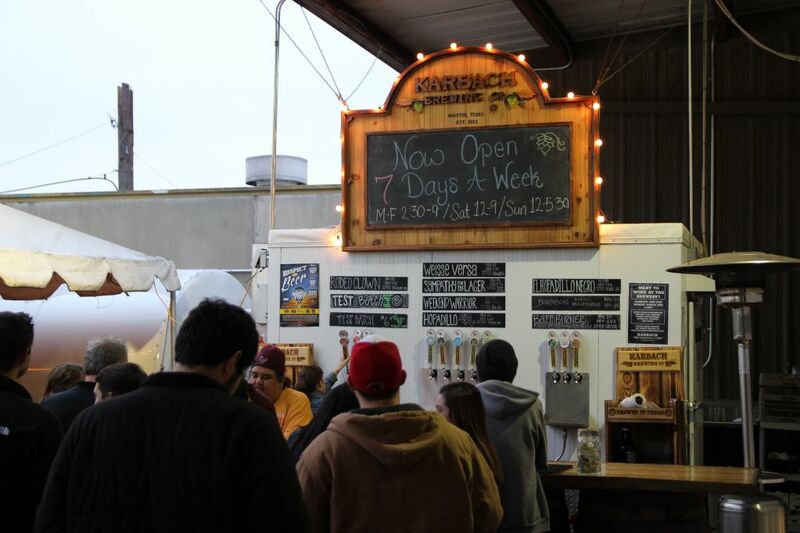 Breweries are open until as late as 10 pm, and feature music, food trucks (sometimes including barbecue), games, and lots of people milling about. We enjoyed the party while downing our beer and chilling to the Houston downtown skyline. I ordered up a Dome Faux’m, a cream ale that is a “tip of our hat to the light, easy-drinking beers served at the Astrodome”, and an Alternate Universe which is a malty dark ale and enjoyed both. Cory has a little hipster in him and also had a Hopston which is made with a bunch of hops and carries an International Bittering Unit rating of 88, far too hoppy for myself but within the range of those more hip than I. 8th Wonder was not my first brewery to visit since the laws changed, but the overall vibe was one of the coolest. Next up was the Beer Can House. 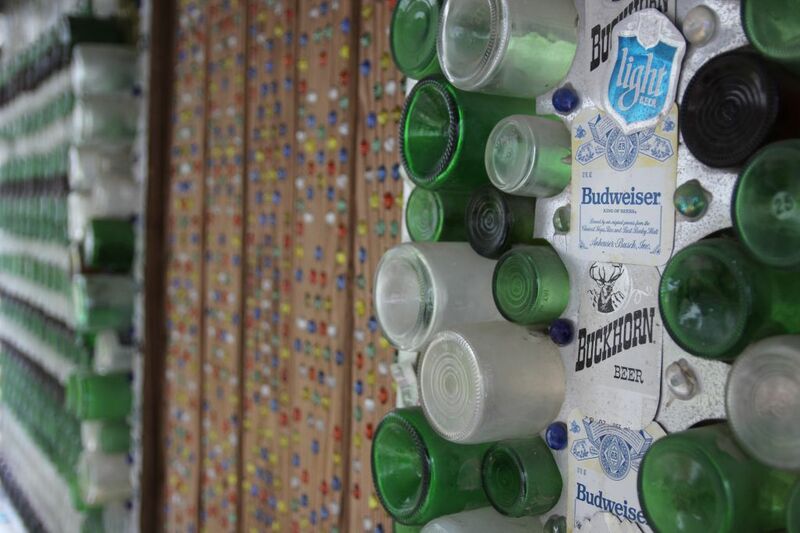 John Milkovisch, a retired upholsterer for the Southern Pacific Railroad, began cutting up used beer cans and attaching them to his house in 1968. 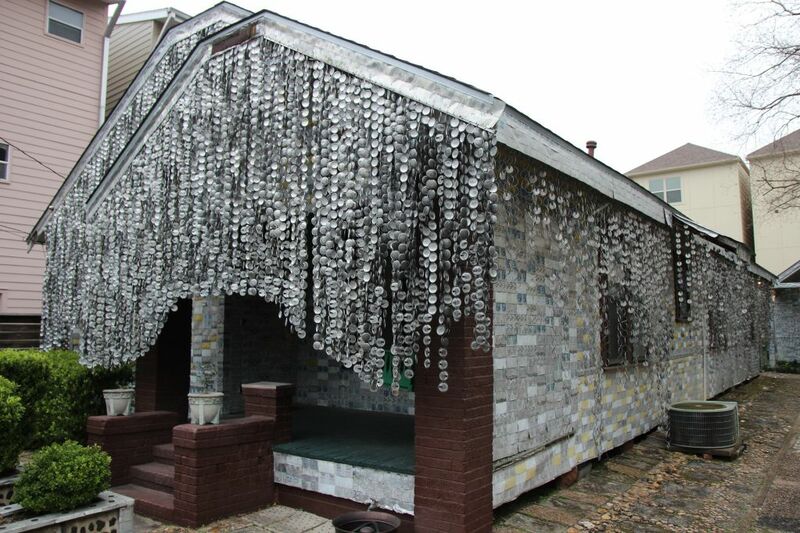 It continued to grow and with his understanding and supportive wife, Mary, the Beer Can House became a public attraction. It steadfastly and stubbornly stands while the surrounding neighborhood homes are being torn down and replaced with tall and stark three story townhomes. Both he and his wife have passed away, but the house remains and is maintained by the Orange Show Center for Visionary Art. The Orange Show itself is a different attraction but we would have to save that for another trip. The group also runs the annual Art Car Parade and the Art Car Museum which we scratched of the to-do list due to timing. As we toured the small house it truly amazed me how Milkovisch’s unintended legacy is a tribute to the common man. He put a tremendous amount of time into his project and to me it’s a reminder to do those things that make yourself happy and content. Many of the aluminum labels have faded but after walking around for a while you get a sense of the man’s passion, even if not understanding the specific reasons behind such. We were headed to our next stop when we passed Hughes Hangar, a local bar that sits next to Glennwood cemetery. 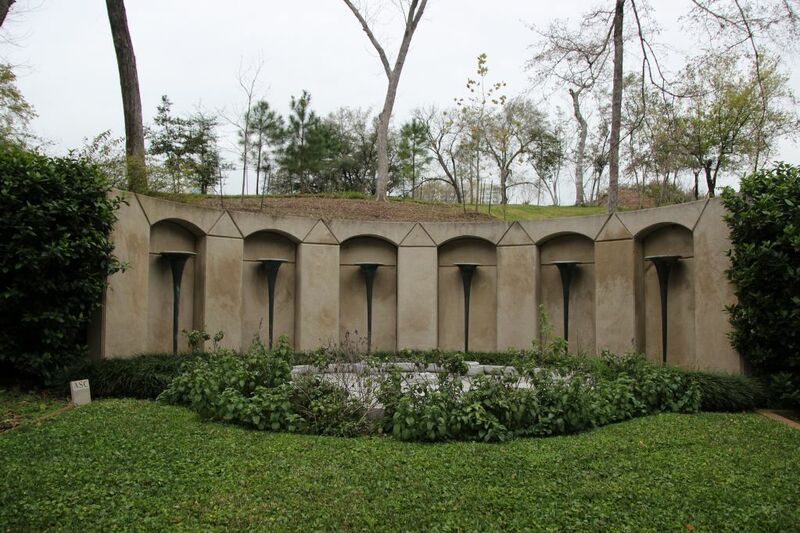 Remembering that Howard Hughes is buried in Houston we pulled into the cemetery and with a little research found his gravesite. It is a relatively simple one and my thoughts drifted back to Milkovisch’s house. I thought to myself that when I pass away I would much more like to be memorialized by something like the Beer Can House than a stodgy grave. 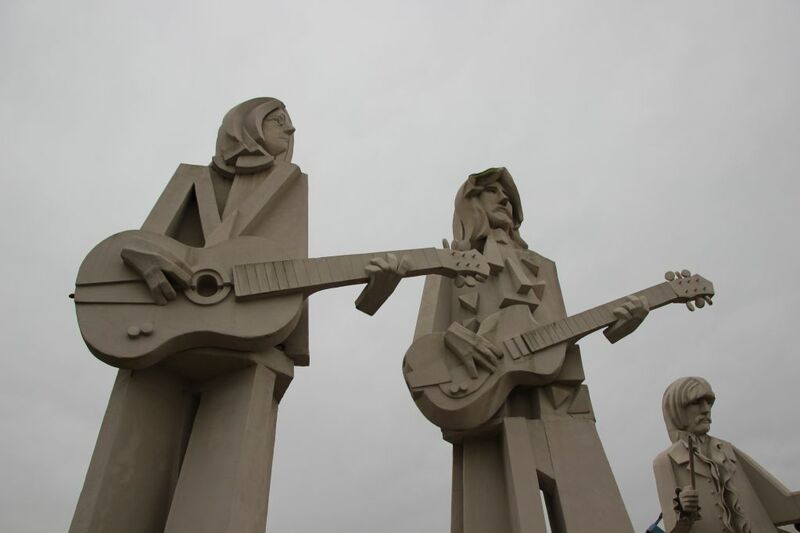 Just down the road was another quick stop for the giant Beatle’s statues. They were crafted by David Adickes, who also has sculpted giant Texas historical figures such as Sam Houston located in Huntsville. These stand gauntly and impressive but feel misplaced in the dirt lot and don’t overlook anything in particular. There were previously large presidential busts in the same lot but they have been moved elsewhere. We realized that while we would be doing a bit of zigzagging it would be worth the effort to visit Spec’s Liquors downtown location. If you haven’t been and enjoy adult beverages I highly recommend making it a stop. 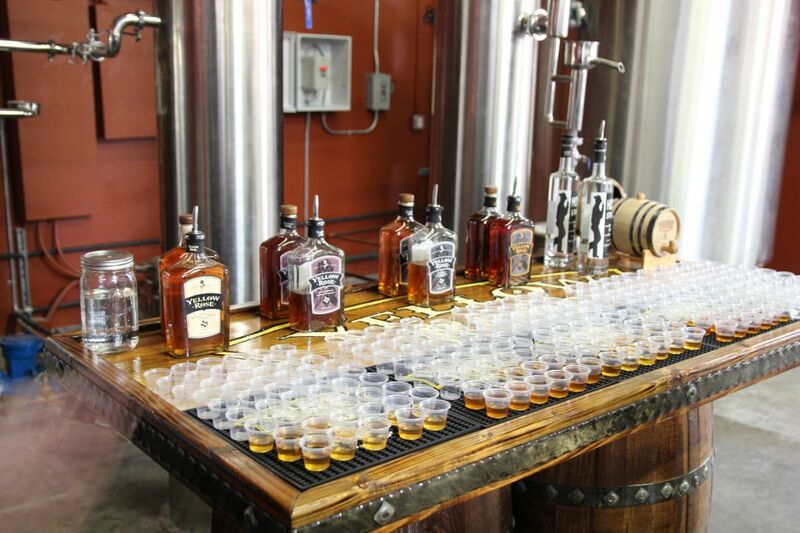 The variety is extensive and they usually have liquor representatives on hand giving away samples. We enjoyed a few samples while checking out the craft beer section. I picked up some Twisted X lager while Cory grabbed a six pack of More Cowbell from Buffalo Bayou brewery. 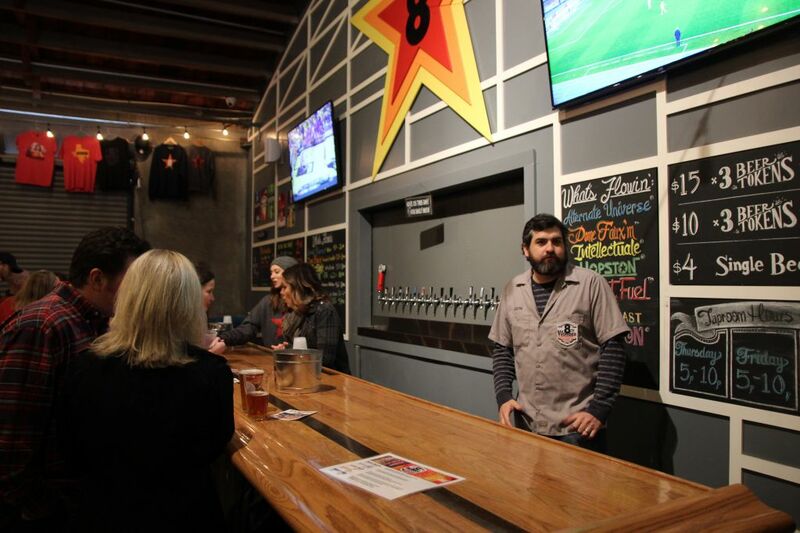 I had actually wanted to make the brewery a stop as they would be open from 6-9pm and Blood Brothers barbecue was going to be on hand but it just wasn’t going to fit into our schedule. The day was getting long so we ventured up to Karbach brewing. Like 8th Wonder and others, the atmosphere was festive. It was nice to wind down the day and relax under the large canopy while drinking some good brew. I tried out a test brew of a kolsch style beer which I enjoyed as well as Barn Burner which is a saison, a type of pale ale. I can’t recall what Cory drank but I’m sure it was more adventurous. Ready for dinner we headed off to what would be our last stop of the day, the Brisket House. 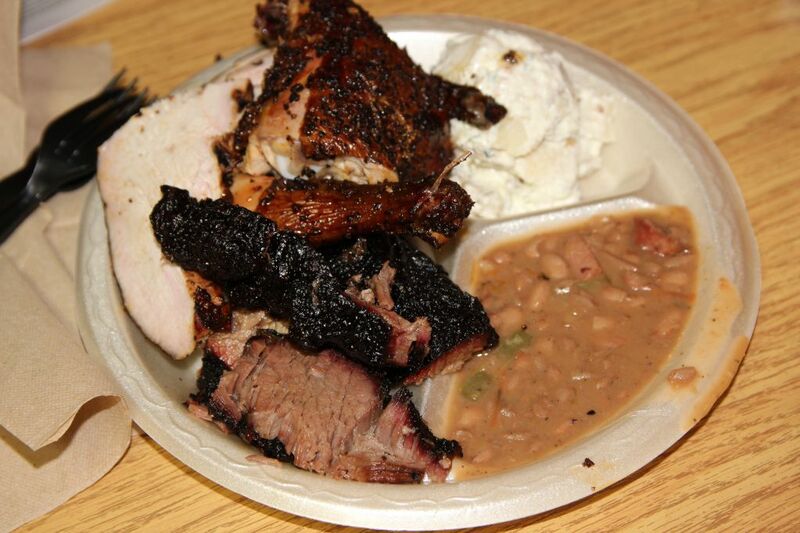 I’ve done a review of them before, and had just visited with the Houston Miata Club a few days earlier but there are few truly good dinner barbecue options in Houston. They are a solid option for anytime and Daniel Vaughn of TMBBQ agrees. Leslye and I ordered a three meat plate with brisket, turkey, and chicken and I grabbed a PB&J (Pulled Pork, Brisket, and Jalapeno sausage on a jalapeno cheese bun) for Cory. The moist brisket was the star of our plate but the other meats were good as well. The dinner settled well into our stomachs and we headed out to see a Beatles tribute band, the Fab Five, perform. I’m not a big Beatles fan but they also play other music from the 70’s such as the Rolling Stones. It was about a forty minute drive and before we arrive we got a phone call from our son, Wyatt. An overnight camping trip was cut short and we would need to pick him up which was another hour away. We were all a bit exhausted so we called it a night. Tags: Pappa Charlie's, The Brisket House.